Offering guaranteed no data loss SSD due to faulty memory. The hard drive on a computer is the most important element of any personal or professional workplace. The hard drive stores all of our most pertinent and in some cases, priceless irreplaceable digital content. So why would you take such a critical part and not ensure you’re using the best and most reliable hard drive in the industry. The Optiarc SSD has been extensively tested and qualified to meet the strictest and most rigid standards of any SSD on the market today. Most SSD drives are simply tested briefly if at all to ensure that it can be recognized and shows the storage capacity it’s listed to have. This does nothing to protect against corrupted memory cells, slow processing read/write speeds, susceptibility to data loss, or any number of potential pitfalls that can partially or completely corrupt the SSD and lose critical data content. On top of that, many of the low cost SSD’s use recycled and/or limited quality flash memory that has a high potential to breakdown in a shorter timeframe. The Optiarc SSD had been put through a rigorous testing process to ensure our SSD drives are as robust and reliable from day 1 and for many years to come. 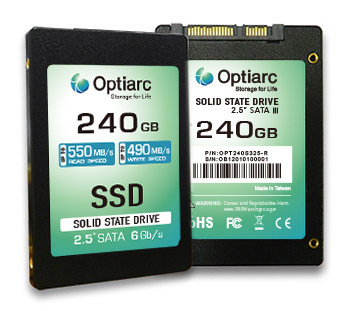 The Optiarc SSD protects and stores its content in memory that had been tested extensively, meaning you can have piece of mind that you won’t need to worry about losing your important and irreplaceable content. *Based on “out-of-box performance” using a SATA Rev. 3.0 motherboard. Speed may vary due to host hardware, software, and usage.